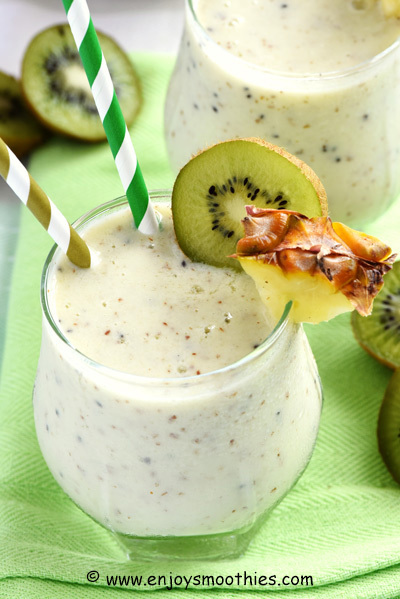 Bananas and grapes may seem like an unusual combination for a smoothie, but when you think about it they truly are made for each other. 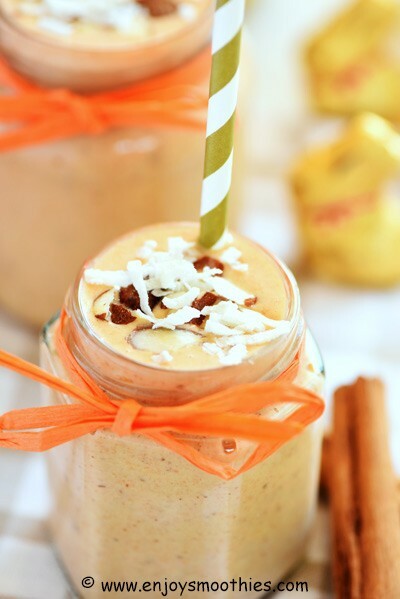 Bananas are everybody’s favorite smoothie addition. 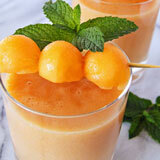 Their rich creaminess adds sweetness and thickness to any smoothie. 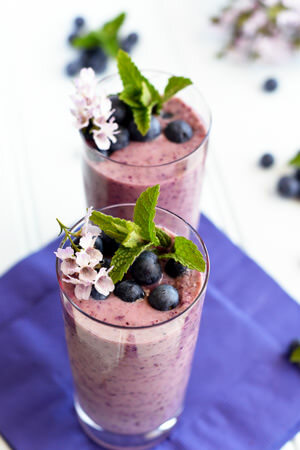 Grapes on the other hand add a sweet tartness to smoothies. I always have a bunch sitting in my fruit bowl. I find they are great to snack on and keep me away from the cookie jar, as one cup of grapes is just 100 calories. 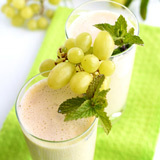 A smoothie can be made with either green or red grapes. But be aware there is a difference in sweetness. 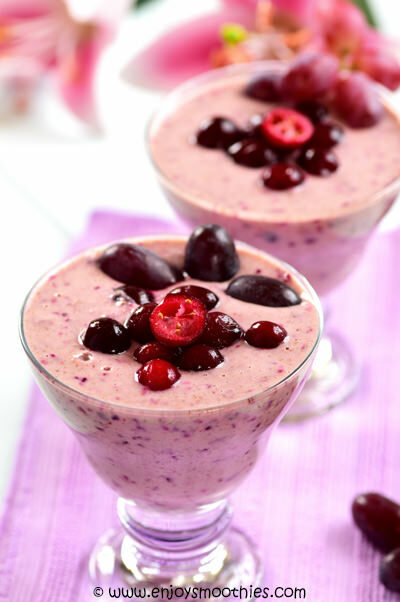 Red grapes are the sweetest so to dilute, add some tart in the way of cranberries. Green grapes are less sweet, and the blue/black varieties less sweet again. 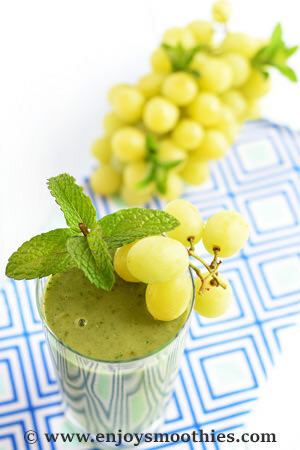 To turn your banana grape smoothie into a green power drink simply add some greens. 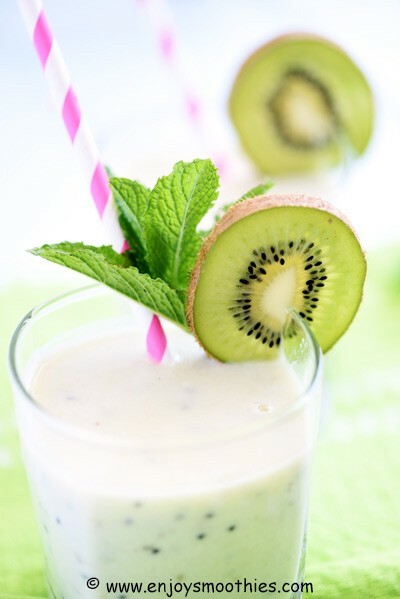 This ramps up the nutrition and counteracts any excess sweetness. Lime or lemon juice is another way to add some tart, and avocado will add extra creaminess. But because grapes are about 80% water, you will need to reduce the amount of liquid used. It is recommended that you wash the grapes beforehand to remove any pesticide residue. I find seedless table grapes the best option for smoothies. Grapes are packed with nutrients and antioxidants, vitamins C and K, potassium and iron. They also contain the antioxidant known as resveratrol. Red, purple and black grapes are one of the best sources of resveratrol, a powerful antioxidant that is thought to fight cancer and heart disease. Bananas contain more potassium than any other fruit. Potassium protects against high blood pressure and is critical for normal muscle, nerve and brain function. The carbohydrates in bananas helps fuel our muscles after a workout. This is why they are so favored by athletes and highly active people. Bananas also contain vitamins A, K C and E, folate, calcium, magnesium, phosphorus and iron. 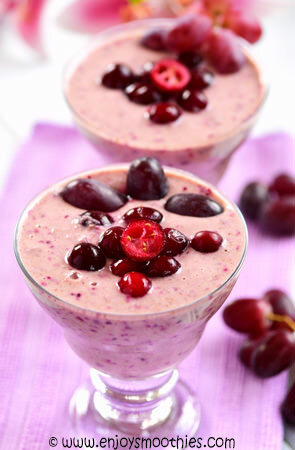 Add the banana, red grapes, cranberries, almond milk and almond butter to your blender and blitz on high until everything is wonderfully smooth and creamy. Takes between 1 – 2 minutes. 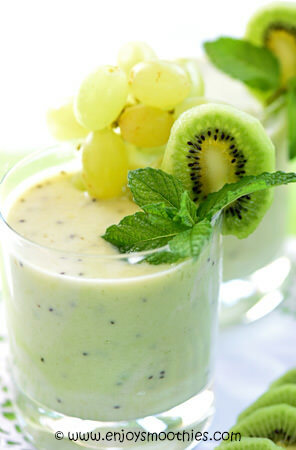 Add the banana, grapes, mint leaves, spinach leaves, avocado, lemon juice and almond/cashew milk to your blender. Turn up to high and whizz everything together until smooth and creamy. 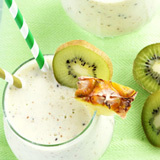 Blend together the frozen banana, green grapes, kiwi fruit, vanilla yogurt and almond milk until smooth and creamy. 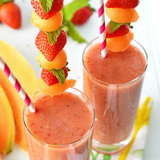 Pour into your favorite glasses and garnish with extra fruit. Combine banana, avocado, green grapes, spinach leaves, pineapple pieces, almond milk and lime juice into a high-powered blender and puree until smooth. Pour into your favorite glasses and enjoy. This makes about 2 cups.